ST. PAUL, Minn. (May 13, 2014) – Pedal Minnesota, in partnership with Minneapolis-based Monopoint Media, have launched a project to encourage women, moms, and kids to ride bikes. It launched on Mother’s Day, May 11. Focused on a Minnesota audience, the “Bike Mom” project runs for eight weeks. It includes a series of articles published on PedalMN.com, social media contests, event appearances, and a major grand prize gear giveaway. The project has a goal to inform and motivate women and moms to bike in Minnesota. In addition to serving as an information resource, the project will feature 5 to 7 “ambassadors.” The ambassador moms will document their experience biking with kids on social media and on the PedalMN blog. A major component of the project is a promotion called “The Mother Of All Bike Gear Giveaways.” More than 10 companies have donated gear, including bike seats, kid trailers, scoot bikes, apparel, helmets, and a mom-oriented bike model for the winners. Minnesota is widely recognized as a top place to ride a bike. Bike trails, on-road bike lanes, and other infrastructure abounds in the Twin Cities as well as out-state. All “Bike Mom” content and the giveaway contests will be hosted on the Pedal Minnesota site. Go to www.pedalmn.com for more information on the initiative. Pedal Minnesota is an unprecedented collaboration of state agencies and private organizations to encourage more people to get on bikes more often, in Minnesota. The partnership includes Explore Minnesota, the Minnesota departments of Health, Transportation and Natural Resources, the Bicycle Alliance of Minnesota, the Parks and Trails Council of Minnesota, and the National Park Service. Pedal Minnesota encourages all types of biking, from leisure to commuting. 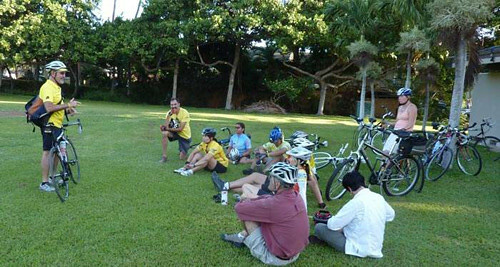 PedalMN.com serves as a go-to resource for information on bicycling, including mapping tools, lists of biking events, personal tips and trip ideas from bicyclists across the state. Monopoint Media LLC, founded in 2006, is a creative agency focused on outdoor, sports, and active lifestyle brands. The company (MonopointMedia.com) is based in Minneapolis and works with brands to build video, stories, micro-sites, social-media projects, and custom events. Monopoint Media owns and operates GearJunkie.com, a widely-read blog covering gear, the outdoors, and active lifestyle topics. Well, we’re a week into National Bike Month here in the U.S….at least for states that choose to celebrate in May (as opposed to, say, March. I’m talking about YOU, Florida). Great things are happening all over the country, from bike-safety clinics, to free commuter breakfasts, to neighborhood tours, “commuter trains”, and a thousand other events. Want to find out what sort of events are going on in YOUR corner of the U.S.? The League of American Bicyclists has you covered…with their handy event finder. Simply visit the link, type in your city, state or ZIP code and voila…a smorgasbord of events to choose from! Ride strong and ride safe, and don’t forget to spread the word…two wheels is not only good for you, for your wallet, and for the environment, but it’s also a blast. If you have any special events you’d like to get out the word on, please leave details in the comment box below. If you are looking to commute via scooter, check out MyProScooter's complete review here. NiteRider Lumina Micro 600 Sale! lechateauguillestre.com on The struggling cyclist. BikeCommuters.com provides news, articles, product reviews, and how to’s of anything that is related to cycling.